1-, 2- and 3-bedroom apartments available now from $1,090 - $2,305! Bayshore Place Apartments is situated within Bayshore Town Center, the premier shopping, dining and entertainment destination in the Milwaukee North Shore area. Located within minutes of Mitchell International Airport, the historic Third Ward, Summerfest grounds, world-renowned parks and museums, Miller Park Stadium (home of the Milwaukee Brewers), I-794, I-94, I-43, I-894, Bradford Beach and downtown Milwaukee, Bayshore Place offers a unique living environment. Just step out of your door and enjoy more than 100 retailers and eateries. After all, Bayshore Town Center is the center of it all! I love living in the beautiful community Bayshore has to offer! I am so lucky to be able to walk to work, shop, live and play without even moving my car. When I do need to use my car, I love that I can hop on the expressway and be downtown in just 10 minutes. Living at the Bayshore Place apartments is the most convenient place to live in the Milwaukee area. Efficient staff, friendly “neighbors” - many services and entertainments available a short walk away - fun gatherings of residents - yes, these are a few reason we LOVE living at Bayshore Place! The support staff in the housestaff office – It never ceases to amaze me how fast they take care of things. Things get done within 5 minutes of Tera and Billy hearing about it; the apartment is very comfortable, it is also nice and quiet, and the people living here are very friendly. But the best of all is LOCATION! Our apartment is exactly what we wished for, the location is superb, and the staff makes you feel that you are indeed home. We are extremely happy that we choose to live in Bayshore! 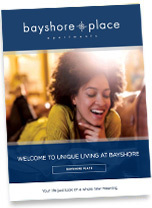 Bayshore Place is a safe, fun and truly convenient place to live. Literally just steps from one's door is entertainment including a movie theater and a bowling alley, a spa, a fitness center, multiple dining choices - many with happy hours and just about any shop you could imagine. Downtown Milwaukee is just 5 minutes away. In the summer there are outdoor concerts, shows and even Saturday yoga in the central square. The staff is friendly and responsive and common areas are clean and well maintained. I am really happy to have made this my home! Bayshore Place has truly been a great place to live. The management and maintenance staff is great and I have everything from entertainment, to shopping and dining right at my front door!